Fame and Advertising Agency Business Development - Peter Levitan & Co. I have an objective that I give to all of my advertising agency clients. I tell them that they need to include FAME as an agency marketing objective. My primary point is that in a universe of 4,000 agency brands in the USA and possibly dozens in their home town, standing out from the clutter is an essential goal. Sounds obvious, right? However, most agencies do not actually have FAME as an objective. Or, maybe more to the point, they don’t actually work hard to be famous. I put David Ogilvy’s’s photo on the left because he just might be the most famous man in the history of advertising. He worked it. In addition to founding one of the world’s most well-known agencies, he wrote three seminal advertising books that propelled his FAME: “Confessions of an Advertising Man” (1963), “Blood, Brains and Beer” (1978), and “Ogilvy on Advertising” (1983). These books formed the platform for his agency’s thinking and awareness. This is an important point. I’ll come back to it. Known and talked about. Interesting, right? One of those easier said than done things. But, I can virtually guarantee you that if you do not make fame an agency objective, chances are you will not get there. I ran business development at Saatchi & Saatchi during its time as the world’s largest advertising agency (and holding company.) 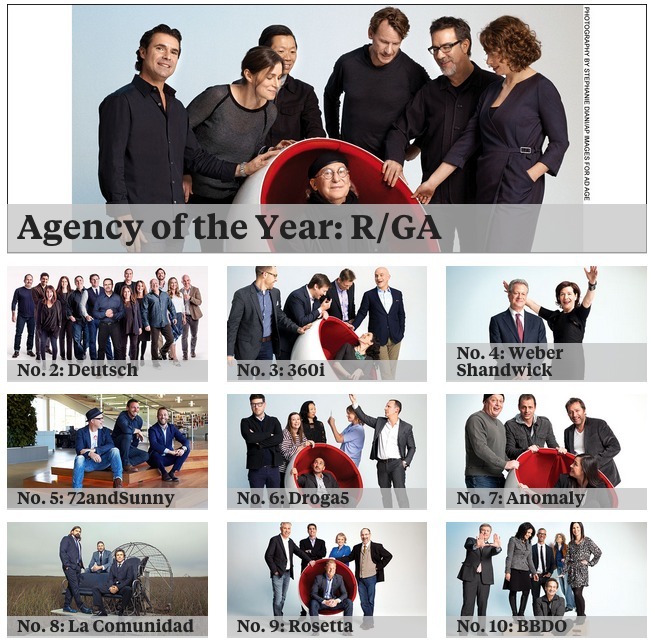 Saatchi was also the most famous agency in the world. I remember getting into cabs in London and just saying, “take me to Saatchi. '” That’s all it took. The agency’s fame translated to the world of prospective clients. We got all the incoming calls needed to fill our new business pipeline. Getting to this point was not an accident. Maurice and Charles Saatchi had made being famous a key element of their business plan. My meeting with Charles did not include any introductory pleasantries — he is constitutionally incapable of them. He told me he would pay me only half what I was already getting — although there might be a 4.5 per cent option on the equity. I had not the faintest idea what that meant, but I agreed without thinking about it, because he was already an advertising legend and I really wanted to work with him. Charles, meanwhile, would growl that the advertising industry was a waste of space and that clients would do better if they buried their money in a hole in the ground. The way to make the agency famous, he decided, was to be in Campaign, the industry paper, every week. Fortunately, the publication had been started by Maurice, so we could always persuade the editor to run a story. Charles would read about the launch of a new brand then call Campaign and make it sound as if we were about to win the account. After a while, he got bored with ringing up under his real name, so he’d hold a handkerchief over his nose and tell them it was ‘Jack Robinson’. Most of his stories were calculated to destabilise clients or rival agencies to our advantage. As you see, the Saatchi’s made being well-known a business objective — that paid off. Fame also paid off for JWT as we often pitched against them. How Much Is Fame Worth? I am about to point you a great article about the value of fame. But, first, here is a chart from the article that states the very obvious. Fame begets market share. 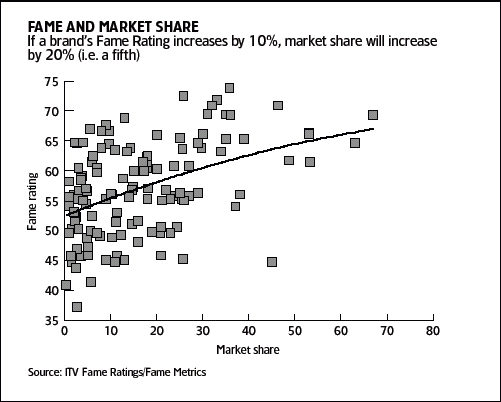 The article, “How Much is Fame Worth To the Bottom Line” is from the UK”s The Marketing Society. They offer a great take on how to get to fame. First is Connection, which is about likeability and relevance – famous brands establishing a mutual bond of care with consumers. The second element is Standout – famous brands create and demonstrate a point of difference to others around them. Then we have Talkability. Whether it is at the breakfast table, the school gate, around the watercooler or in the pub, famous brands get people talking about them. A recent trend is for virtual conversations through internet chat rooms and blogs. The fourth element is Familiarity. Through a combination of awareness and knowledge, consumers have a strong understanding of what the brand stands for. Following on from this is the final element, Universal Meaning. As well as having a strong understanding of the brand for themselves, consumers know that their family, friends and colleagues share what the brand stands for. The Marketing Society guides us to one very important point – a point made by the 2004 ITV study that they site. And, it is a point that is now very well known to all social media proponents. We found that these five elements do not carry the same weight of influence in determining a brand’s overall fame. Universal Meaning is the most important, followed by Familiarity. This is important, since it is a strong part of human psychology that people around us endorse, either explicitly or implicitly, the choices that we make. Explicitly we might seek approval from others for choosing a particular car marque, while implicitly we will choose one grocery brand over another for fear of being caught at the checkout with something that might be embarrassing. Without universal meaning a brand will find it harder for its consumers to enjoy third-party endorsements that they are making the smart choice. It is Universal meaning that is the basis for what most agencies tell me is their single best method of winning new business: Referrals. This is a must have. It is so important that advertising agencies need to milk referrals for all they are worth. Agencies cannot just hope that one client will recommend them to another. Agencies should actively manage the process. I have written about referral strategies for the website Business 2 Community, “Grow Your B2B Sales Through Referrals.” In this case, I refer you to me. Websites like these need content. You need fame. It is a very symbiotic relationship. If you don’t have an expert SEO manager in your agency go out and get one. My primary marketing tool is SEO. That’s probably how you got here. I asked my favorite SEO guru (at L.A.’s HawkSEM) tody how my SEO rankings were doing. Sam sent this back. You look very good for an ad agency consultant. Check out the keywords cloud section, try to get 3 green checkmarks for those terms… How? Just write more content centered around those keywords. Looks easy, right? It isn’t. But, SEO and keyword targeting is not rocket science. Or, it can be, but do not let that stop your agency from writing highly targeted blog posts and working high-quality link backs. That means… stop writing about what else every other agency is writing about. You will never get found. And, guest post. Yeah, I know. PR and massaging journalists isn’t what it used to be. But, some agencies are very good at getting noticed because they know how to present their work, thinking and personality. Others get attention care of winning large famous accounts and shiny awards. Third party blessing goes a long way – especially wins in the larger national or international slugfests that demonstrate proof to the press and future clients that you have the right stuff. This is not an accident. These agencies are gunning for press. There is an art to 2015 PR. Maybe your agency should hire a PR expert. 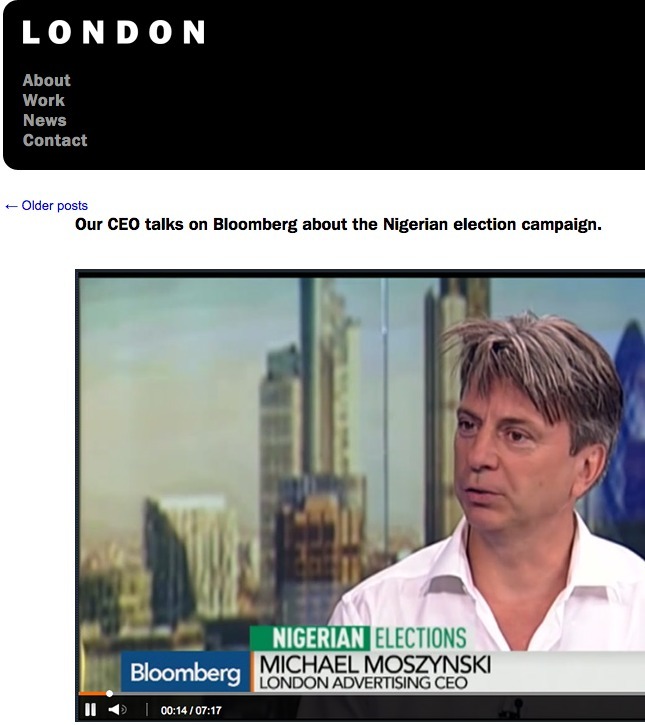 The Bloomberg TV video on the left with the agency’s CEO Michael Mosynski is about, get this, the Nigerian election. It’s proof that PR works. There is an art to 2015 PR. maybe your agency should hire a PR expert. London Advertising did. Get on the BIG lists. Having fame as an objective + working to be famous = better clients + great work = high interest = awards = press attention = fame. This equation works on the local level as well as the world stage. Every market has business press that needs big stories to run. Getting on Bloomberg is good. But, that level of fame might not fit your agency’s objectives. I have a healthcare specialist agency client that wants to be famous across the healthcare marketing landscape. They know that they won’t get there by just having some nice copy about their healthcare expertise inside their large agency ‘brochure’ website. That minimalist approach is what many other ‘healthcare’ agencies do. In this case, their specialty is hidden to all except the future client that is going to dig through the website. To highlight the agency’s expertise, we are building a dedicated stand-alone healthcare marketing website that will directly target healthcare CMO’s, COO’s, CFO’s and specialists. The website and the agency’s white papers and presentations will take a category specific thought leadership position designed to drive high awareness. Some of what they are doing will be controversial. Breaking out from the pack is a key objective. Fame is an objective. Highly targeted advertising on LikedIn, Twitter and in selected industry publications will be designed to strut their stuff. They are also going to use direct mail to get their white papers on the desks of targeted clients. Search engine marketing and a landing page strategy will get online attention. They have a speaking strategy. 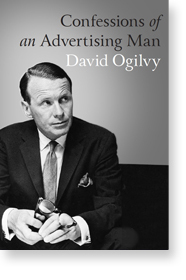 Ogilvy wrote his books. Other agencies write books. Books deliver credibility to your prospects. Books have weight beyond the pixels on your website. My book on pitching has won me advertising agency clients. It has also delivered speaking gigs at agency conferences. Here is a presentation I gave at Hubspot’s Inbound conference on why your agency should write a book. Fame works. Getting it must be a business objective. Being shy won’t work. Telling people what you want works. Just hit this link and I will work to make your agency more famous and richer. This entry was posted in Featured, Marketing, New Business, Smart Agencies and tagged ad agency, branding, digital marketing, marketing, new business, social media, video, website. Bookmark the permalink. Trackbacks are closed, but you can post a comment. Peter, Great post…I enjoyed reading it.